Extra 20% off Sale Items for 1 week only! What a season it’s been! 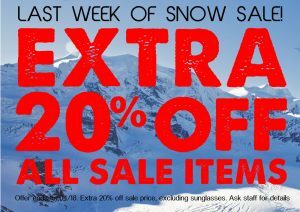 But all good things must come to an end so for our last week of the season we are offering an EXTRA 20% OFF all sale items, including outerwear, accessories, snowboards and more!!! The offer ends on 15th April 2018 and is in store only. Be quick!